Today has been bringing us a lot of new info about the Sony Xperia Tablet Z. We're seeing benchmarks, photo samples, and a hands-on, and now we've got the really important information: when you will be able to buy it and how much the tablet will cost. Just be warned, Sony is aiming for this to be a premium tablet, and that means premium pricing. 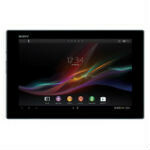 Sony is saying that the tablet will be available in Q2 of 2013, and so far only the US models have gotten pricing. In the US, there will be models in both white and black, and have two storage tiers - 16GB and 32GB. For the WiFi-only models, it will be $500 for the 16GB and $600 for the 32GB, which is pretty expensive, even when you consider the tablet has a 1920x1200 display, 8MP rear camera, Snapdragon S4 Pro processor, and is waterproof. There is also an LTE model in the works, but so far that is Europe only, and there's no pricing available for that. What do you think? Is the Xperia Tablet Z worth the premium pricing? I think people would rather buy iPad/Kindle/Nexus7 than this. Way too expensieve. The specs are amazing though. flop show from Sony again because of insane pricing! N10 = better specs and better price. I love Sony, but I'll take bang-for-buck. Yeah the N10 is better, but not really available here in Europe since not al countries can order phones through Google Play. And if you can get your hands on the N10, it is more expensive than the xperia z. It's a shame. Here in the Netherlands I have to pay €550 for a N10 16gb. To expensive??? did you really just say that and mention ipad in your comment at the same time? I think its a little bit expensive, if you have in mind iPad have the same price and I think iPad make better tablets than Sony. Wait for iPad 5 and it will have the same price and better spec I think . And there is also a Nexus 10 so I wouldnt buy this one. Both the iPad and Xperia Tablet Z are overpriced. i like it and if one day i wanted to buy a tab, i go for this one. Big yawn...... if its priced above IPad, no one will buy it , so why bother making it. By the time they cut the price due to lack of sales it will be outdated. what does Ipad offer except a boring and reiterative design and an useless OS? this one is perfect. SO SOny will sell ten of them for $600 each and drop support. You like that? Buy it. Except that this time around the Tablet Z will be accompanied by the buzz that the Xperia Z created. I think this will be enough to double its sales comparing to the Tablet S. However I also agree that it is a bit overpriced considering that at least from a construction point of view it doesn't sport anymore an aluminium body like the Xperia Tablet S and the iPad. I dunno, being only a little heavier than an 8 inch tablet and thinner than the ipad mini while sporting a 10.1 inch screen is pretty appealing. I would buy it over the giant overheating ipad 3/4. And if it was $399 I would buy it over the Nexus 10. Only Sony can top Apple as the most over priced brand in the world. When was the last time Sony produced any innovation , any product worth their inflated pricing? !986 I believe. Get real Sony, you lost your luster 2 decades ago. thats because Sony is the father of apple. just make a little research and you'll find out that Sony was the source of inspiration for apple to build its first phone. Sony will never learn, expensive much? Everything they make is junk since 1986. Why or don't you like SONY? The thing is....this isnt the 80's anymore nostalgia boy...if youre playing catch-up to Samsung or Apple...you absolutely have no right to put a premium on your washed-up brand.